← Restaurant Review: Guasaca Arepa & Salsa Grill, Raleigh, N.C. Most of the websites I visited had instructions on how to seal your jars using a vacuum-pack machine, once they were filled. Since I do not own a sealer, I found a few sites that said you could get by without sealing the jars, but the salads just wouldn’t last for a week. 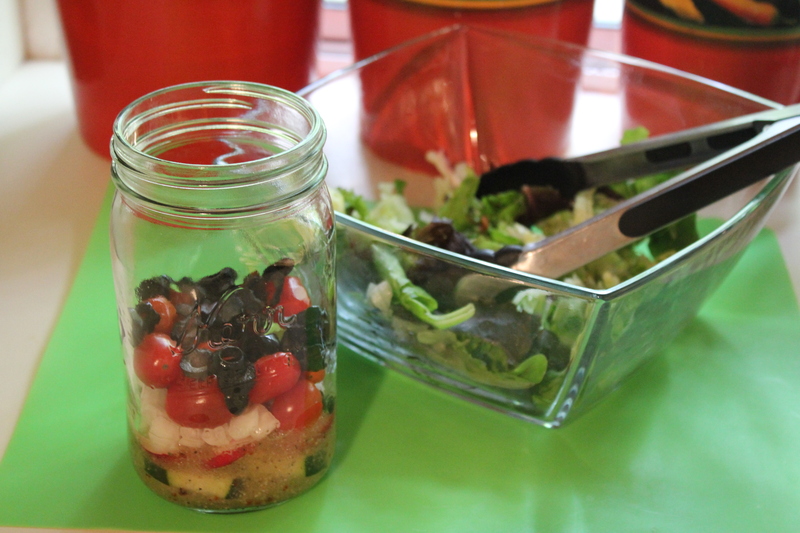 I decided to make three salads to be eaten 24, 48 and 72 hours to see just how fresh they would be without sealing them. 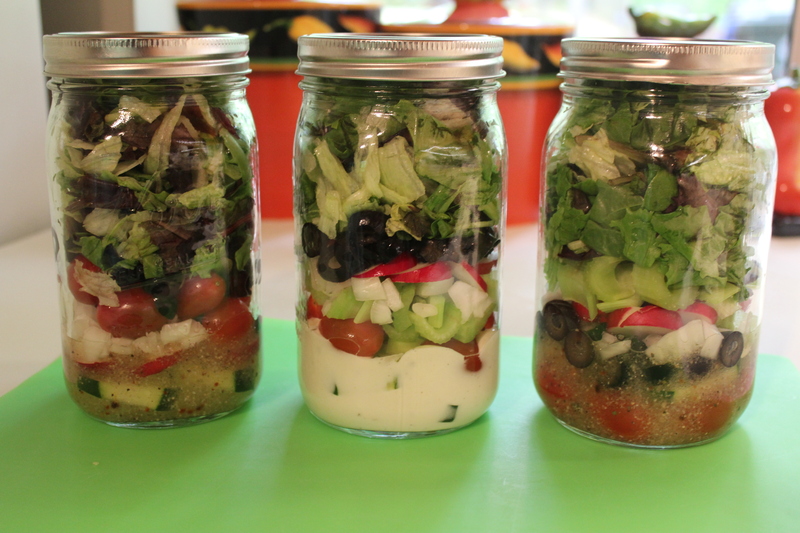 The most important thing in making these salads is the order in which you place the ingredients in the jars. I used quart-sized, wide-mouth Kerr jars. The wide-mouth jars make assembly easier. First in is the dressing. You want this at the bottom of the jar where it will not come in contact with the lettuce. 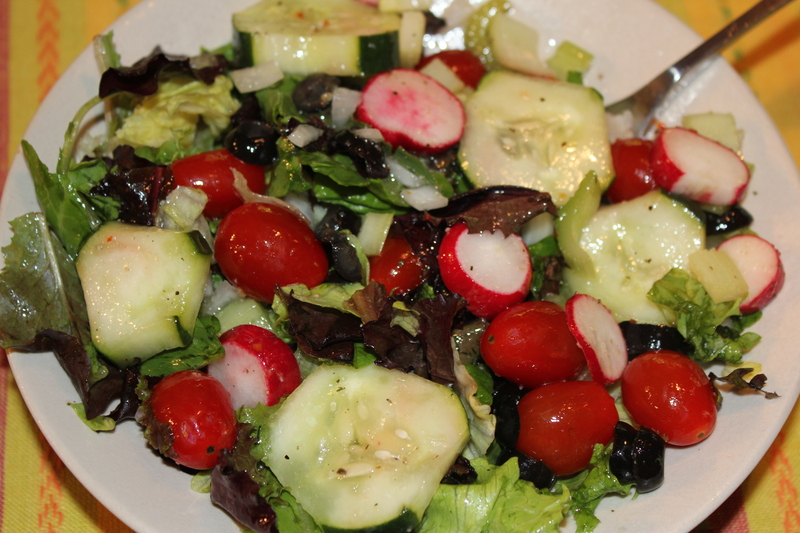 I wasn’t sure how much dressing to add – some sites suggested 2 to 3 ounces, but that was too much for me. I used Italian dressing for two of the jars and Ranch for the other, and next time will use 1 ½ ounces of the Italian and 1 ounce of the Ranch. It really depends on how much dressing you like. Next, add the heavier vegetables. 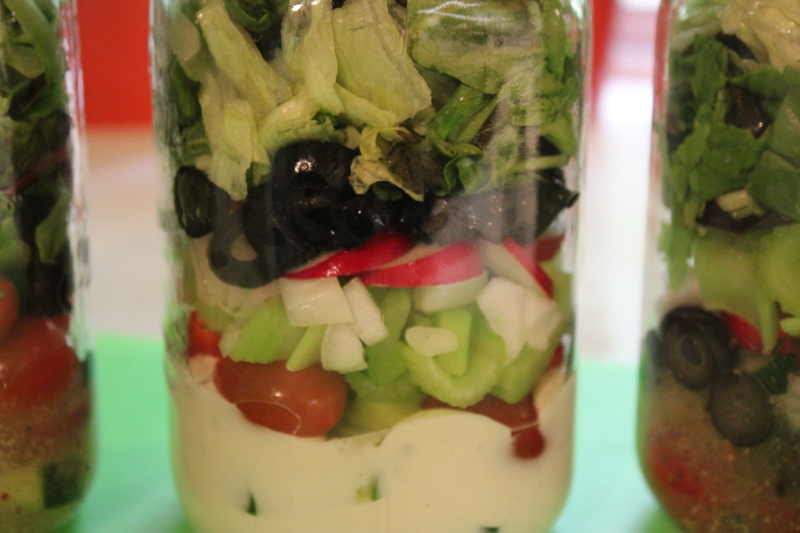 I layered grape tomatoes, cucumbers, radishes, onions, black olives and celery – things that I thought would taste good after marinating in the dressing. I would have added carrots but was out of them. Just choose whatever veggies are your favorites. If you like chicken or other meat in your salad, this is where you would add it as well as any dried fruit, such as cranberries, or any nuts or sunflower seeds – the combination of ingredients is almost endless. Last in the jar is the lettuce. 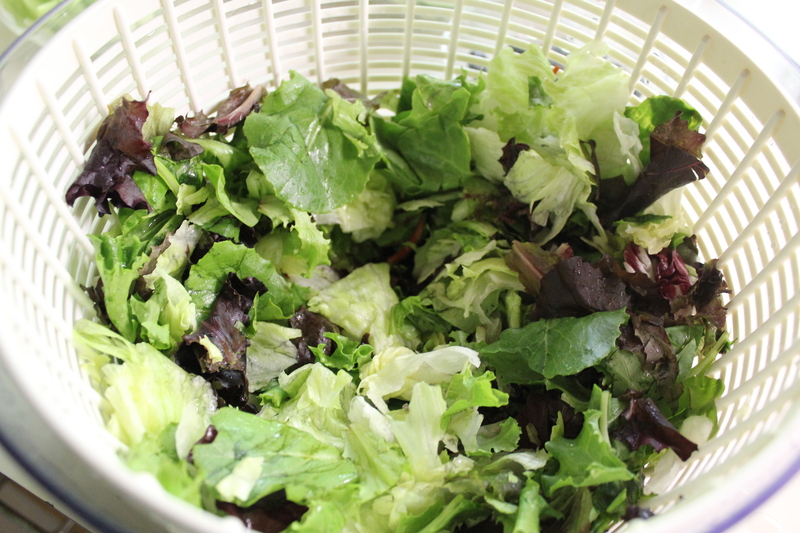 I tossed some spring mix and iceberg and put it in my salad spinner. Make sure that the lettuce is completely dry before you put it in the jar. I used about 2 ½ cups of lettuce per jar, but that will vary according to how much other ingredients you use. The second salad I had a little more than 48 hours after making it. 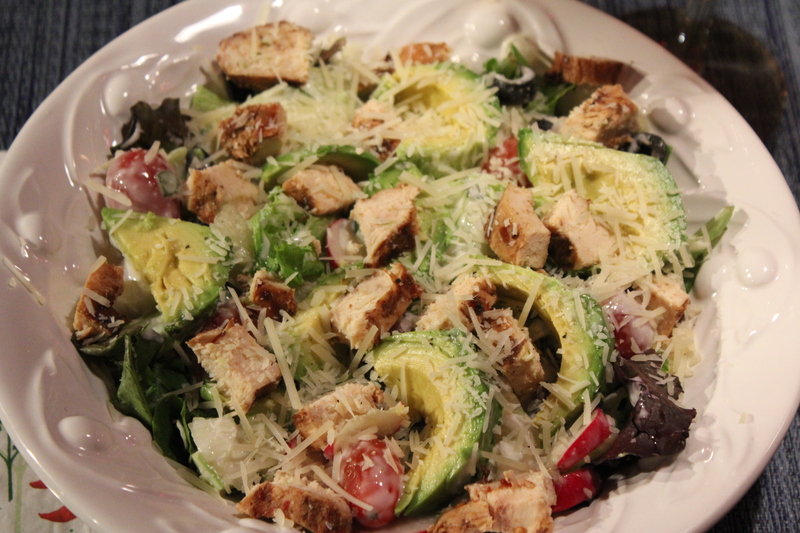 I had this one for dinner, so added some leftover grilled chicken, sliced avocado and parmasean cheese. 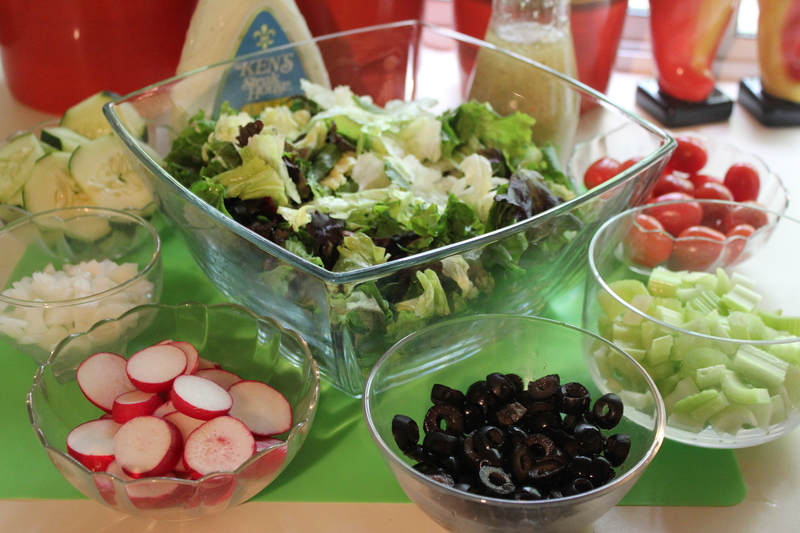 I especially loved the veggies that had marinated in the Ranch dressing – what a great combination. The tomatoes and cucumbers were still firm, but not quite as much as the day before. The lettuce was still nice and fresh – no sogginess whatsoever. Grade: A. Bottom line: This is a great way for me to eat more salads during the week since I save so much time by preparing them all at once. They are much less expensive than what I can get in a restaurant and I’m eating healthy, too. This entry was posted in Recipes, Tips, Vegetables/Vegetarian/Vegan and tagged eat drink and be merry, fresh salads in a jar, Kel's tip of the month, Salad in a jar, Salad recipes, vegetarian recipes. Bookmark the permalink. 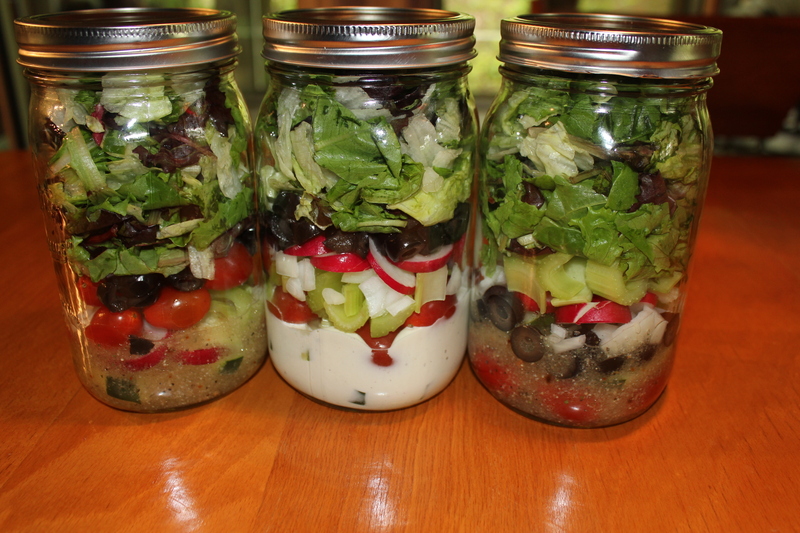 Just made my salads for the week. In each jar: 2 Tbs. Lighthouse Pear Gorgonzola dressing, chopped pear, a little diced green pepper, candied pecans (fry 1 tbs. butter, 1 tbs. br. sugar, 1/4 c. pecans for 1 min. ), fill the rest of the way with romaine lettuce. Can’t wait for lunch tomorrow! Sounds great! Please let me know how they turned out.